We reached the new junction we encountered about an hour ago, but instead of heading off to the left, back in the direction of the entranceway from the crossroads, we went straight on towards the new set of structures. We hadn't yet managed to explore this area yet, but luckily the walls of the area we headed towards didn't seem as large as the first structure. It shouldn't take too long to explore that area. Let's just hope we found something pretty quickly. Carefully, we made our way inside the entrance of the new structure, we found absolutely nothing of interest or value; there were no Affinitas cages or strange creatures, there was nothing... Just a set of awkward-looking stairs at the far end... Heading up them, we found that it led up to a higher floor, which was equally as deserted as the lower floor. We had begun to wonder if there was anything over this side at all; the area was incredibly dark, and seemed to be less populated with life than the original structure. Before leaving however, we found another set of stairs leading up, and after exploring them, we found it led to a small tower, right above the rest of the structure. Looking across to our left, we could see another section of bridge leading away from the tower, but it seemed to stop rather abruptly; large chunks of the Nether stone bricks were missing, suggesting a collapse long ago. "Looks like we're heading back over in that direction..."
We headed down the stairs, down from the tower, in the direction of the original structure we had encountered. I was beginning to think that HoN Co. may have beaten us to the Ender Eye here... If that was true, how far ahead were they...? We had reached the opening for the first structure we had encountered, but had turned left this time, instead of right. The right fork had taken us through a series of passages that had become incredibly complex to follow, even when using torches as a guide. This new path was completely unlit as well, but we remedied that with a few torches embedded into the walls. The left path had immediately taken us down an entire floor; as we descended, I oddly enough felt the area around us grow colder... I didn't think that was possible as technically we were moving closer to the lava lake this structure sat in, but I almost physically shivered as I got to the last step. Adding some light to the scene, we were able to make out the basic construction of the passage before us; unlike the other direction, this was straight and didn't have deviations from the main path. Instead there was a small turn off to the far right at the end of the passage indicating only a single direction to head in. "Right, we need to be careful from here on out. If we're getting closer to the Ender Eye, or the location of where it used to be, there are bound to be creatures lurking close by. We can't let them get the upper hand. If you see or hear anything, you let me know." We continued along the passage, down to the far end, where we did indeed find the passage move off to the right. Squinting down this new passage, we could see it also only seemed to have one direction to head in. If this was the case, we shouldn't be long at all! Provided we found what we were looking for. However, after a few minutes, we reached a junction much like we had encountered before, splitting off into four directions. "Any ideas which path to take now...?" "I was going to suggest splitting up, but I know that's a stupid idea..."
Turning to head down the left path, we didn't get very far before we were brought abruptly to a halt by a large wall... A dead-end made from plain Nether stone seemed to suggest a possible cave-in which was currently blocking our path to the other side. "Not much we can do about that. We should try one of the other two paths and then come back here if we find nothing more." Heading back the way we came, we headed off to our left in the next direction; luckily we weren't brought to a halt in front of a dead-end within a few minutes of exploring the passage. In fact it seemed to go on for some distance. Much like before, it just seemed to be one long passage with no alternate passages or tunnels. At the end, it too bent off to the right, but instead of opening up to another long passage, it opening up to a large room! Carefully heading into the room, we were all had our eyes on the two cages set on either side of the room. 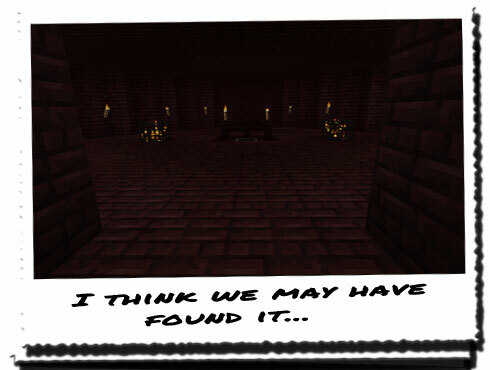 They too had the same strange miniature versions of the flame creatures spinning like a top inside, but there were no actual creatures nearby at all... We had avoided heading straight into the room anyway just in case, but after a thorough check, it seemed this too was deserted. "Do you think this is the right place?" "This is certainly the closest we've come to finding something like what we're looking for..."
In the centre of the room was a fenced-off area with a small dip in the ground. It looked like a small basin that was used to hold or collect something, but there was already something in there. Not a liquid like the bowl suggested, but a single spherical object, that had a split down the centre, and was a mix of strange blues and greens. 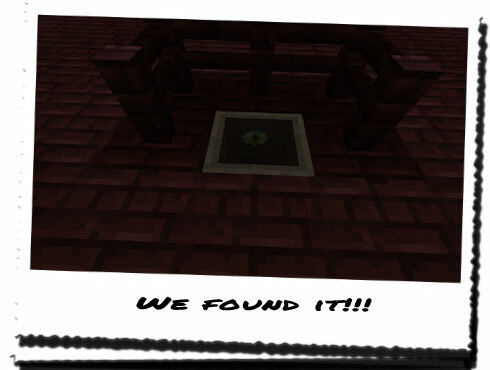 The Ender Eye!